It’s the most wonderful time of the year – or at least it’s supposed to be. Trees are decorated, lights are strung, stockings are hung, lists are made, and parties are planned. Emotions can skyrocket to the highest highs and then crash all in one week. It’s a season full of expectations. Expectations of ourselves. Expectations of others. Expectations in the form of gifts and Christmas lists. Expectations about family interactions. Expectations about memories to be made and thank-you’s to be given and received. Expectations about traditions. Expectations can be overwhelming for children, youth, and adults alike during the Holidays. Often, they present themselves in the form of deregulated, unusual, or frustrating behaviors in our young people. Older children and youth often aren’t able to immediately convey how these expectations impact them, but if you take a step back then you can see. You can see it in the teen who struggles with depression this time of year. Or the youth whose behavior spirals downward as they struggle to manage the anticipation of Christmas approaching. You see it in the young adult striving toward perfection this season in order to balance the pressures of extended family being around. Or in the child who struggles with the memories of happy Christmases with a person whose loss of relationship is still fresh. You can see it in the teen mom who is trying to balance her own wants with the desires of her child and for her child. In addition to expectations we place on ourselves or have placed on us, there are all these other expectations around, often propelled through TV and social media. My holiday season doesn’t actually look like the commercials. Nor does it look like Instagram. There isn’t snow falling outside (thanks, Texas) as we all sit and laugh by the fireplace. There isn’t a long table filled with extended family members who are all using their manners and talking about non-controversial topics. There will be no new Lexus. My kids and their cousins aren’t wearing matching, Christmas coordinated outfits as they play kindly together with their new toys. There’s an old proverb that says, “Expectations are just premeditated resentments.” At first, I wasn’t sure if I agreed. But the more I reflected on it, the more I realized how true it is, in normal everyday life, but especially during the holidays. Chasing expectations or trying to live up to others’ can be a holiday joy killer. For ourselves and for our families. For the students we work with. The gift might not be perfect. That family member might not come. There might be fighting when the willingness to play nice wears off. The money might not be enough, or the dread of impending debt can be crippling. Flash back to the iPhone conversation. I quickly explained again to my daughter that I was not getting her a phone and neither was Papa. She was devastated. However, had the expectation of the phone continued to grow for 2 ½ more weeks, the devastation would have grown as well. With the expectations of an iPhone now put to rest, my daughter was able to enjoy the gifts she did receive without the disappointment on Christmas morning. For yourself: What expectations placed on you by others are weighing you down this year? Who do you need to let down gently? What personal expectations do you need to lower or adjust? 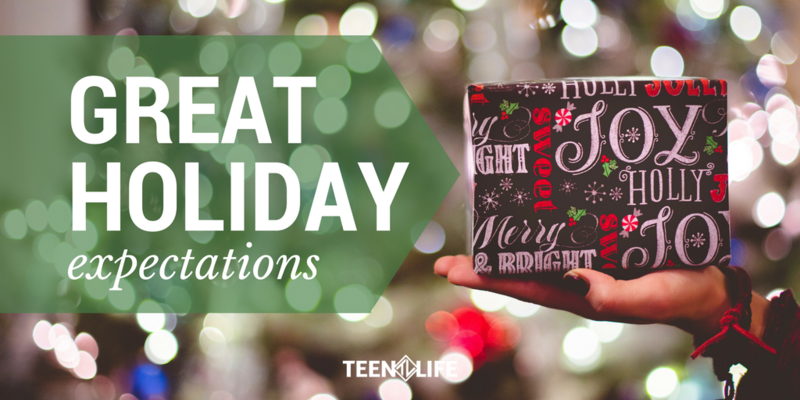 For youth that might be struggling this holiday: What are their plans for the holidays? What are they anticipating about the holidays? What they are nervous about or dreading during Christmas? Sometimes our youth seem hyper-expectant and overtly emotional, and other times they seem to blow off the holidays in apathy. My experience has been that all still feel the pressure of expectations. It has also been my experience that talking to them about their interpretation of expectations can be freeing for them and allows us to see what needs or struggles exist. As you head into this season, start by checking your own expectations and then helping those around you understand their own expectations. You might just be surprised at how it changes Christmas.